Welcome to Bad to the Bone Tattooing! 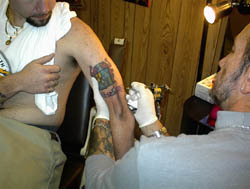 The premier tattoo and body piercing studio in Northwest Florida. Located in Lake City Florida, we offer thousands of ready made designs (flash) and an unlimited amount of custom designs! With over 20 years of experience, our award winning and nationally recognized artist, Steve, is ready to create your dreams and fix your nightmares. We pride ourselves in being safe and clean. We use new needles, inks, pigments, gloves and caps on every customer. We have an extensive sterilization policy that we follow all of the time. Used needles are destroyed and disposed in compliance with health standards and regulations. Conveniently located in Lake City with easy access to I-10 and I-75. No appointment necessary. Walk-ins are welcome. We are inspected and Health Department approved and operate within the guidelines of Florida State Law and the professional standards of the tattoo industry. Driving directions to our Lake City Studio. The word tattoo comes from the Tahitian "tatu" which means "to mark something." click here to learn more about the history of tattoos.